Chengdu is known as the “Country of Heaven” and the “land of Abundance”.It was established in 311BC.Its prehistoric settlers included the Sanxingdui culture .Founded by the state of the Shu prior to its incorporation into China, Chengdu is unique as a major Chinese settlement that has maintained its name unchanged throughout the imperial,republican,and communist eras. It was the capital of Shu during the Three Kingdoms Era, as well as several other local kingdoms during the Middle Ages.After the fall of Nanjing to the Japanese in 1937,Chengdu briefly served as the capital of China. 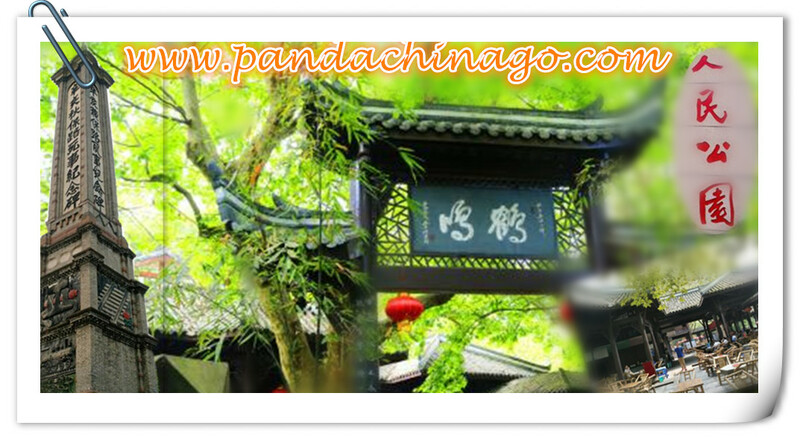 So Chengdu is a famous historic and cultural city in China. 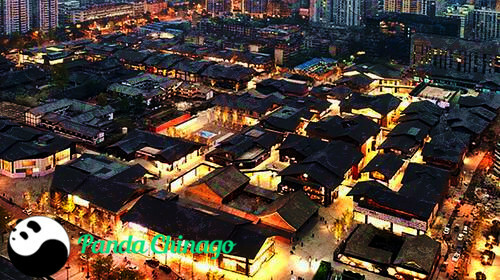 Chengdu has a population of 15,000,00 and covering a total area of 14,378.18 km2. Chengdu, the capital city of Sichuan Province.It is now one of the most important economic,financial,commercial,cultural,transportation, and communication centers in Western China.Modern civilization and ancient cultural relics add radiance and beauty to each other. 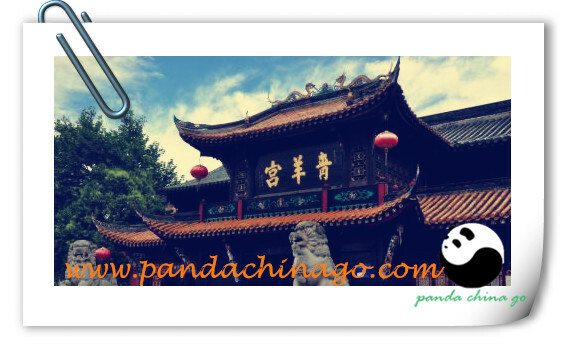 Chengdu has a monsoon influenced humid subtropical climate and is largely mild and humid. It has four distinct seasons, with moderate rainfall in the warmer months, and relieved from both sweltering summers and freezing winters.Temperature in August is around 25-34℃, in January is around 5-12℃. Today,Chengdu famous for relax and livable city in China. Local people enjoy the work and pleasure here. Most locals go to tea houses to play Mahjong with friends. Some tea houses also offer live entertainment such as Sichuan opera shows ( famous for face-changing), ear-picking, foot massage,oil spa and tasty snacks. Sichuan cuisine also the most popular food in China. Sichuan dishes are based on rich products of Sichuan. Wide-ranging resources of raw materials from river to mountain and rich condiments are two important characteristics.Chengdu is a food paradise in China, tourist can enjoy delicious dishes such as Kung Pao Chicken, Sweet Sour Pork and Hot Pot. The Panda is the Highlights in Chengdu tour, There are 4 Main Panda Bases in Sichuan; Each have specific traits, chengdu panda base is most convenient for tourist, 30 mins car ride from Chengdu downtown. Chengdu giant panda center of breeding and research attracts almost 100,000 overseas visitors each year. Covering tens of hectares with bamboo groves and a native-like habitat, have more than 50 pandas,only here,you can see the baby panda.
. Be an early bird , morning is the best time to see active pandas.Especially in summer, when temperature gets high, panda will become languished and stay inside the air-conditioned enclosure.
. when entry, take the sightseeing car around the base is recommend to the senior.
. moon incubation and sun incubation is highlight of panda base, just remember sun and moon.
. panda souvenir shop nearby the exit.
. If you want to join Panda Volunteer Program or want to take pictures with panda,Chengdu Panda Breeding Center is not available anymore. 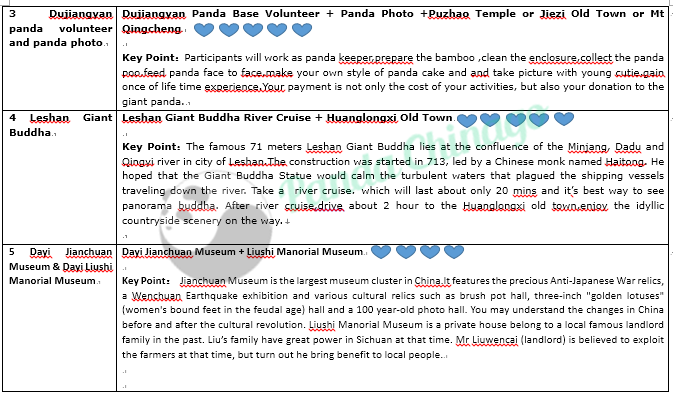 Dujiangyan Panda Park is the closest available place.Early reservation for panda volunteer is highly recommended,as there will be limited participants for panda volunteer&panda holding programs.You can reserve in advance with Pandachinago travel service.we prepare the easy procedure for you. 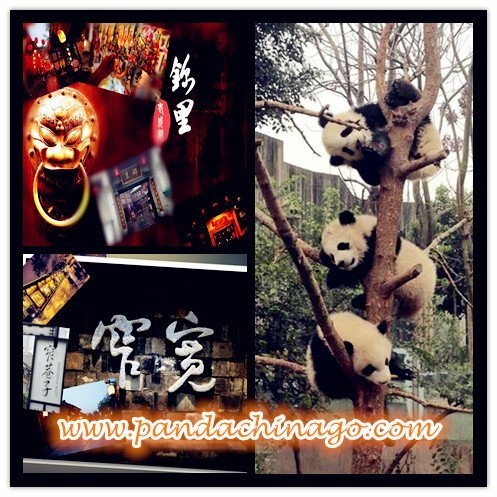 Morning: at 8:00am, the driver will meet you in hotel lobby,heading to Panda Breeding Center to watch panda having breakfast.The tour is about 2 hours,The adorable pandas from Baby to adult will present you a unforgettable morning. Afternoon:Drive back to Downtown.Complimentary sightseeing of People’s Park experiencing the local lifestyle. 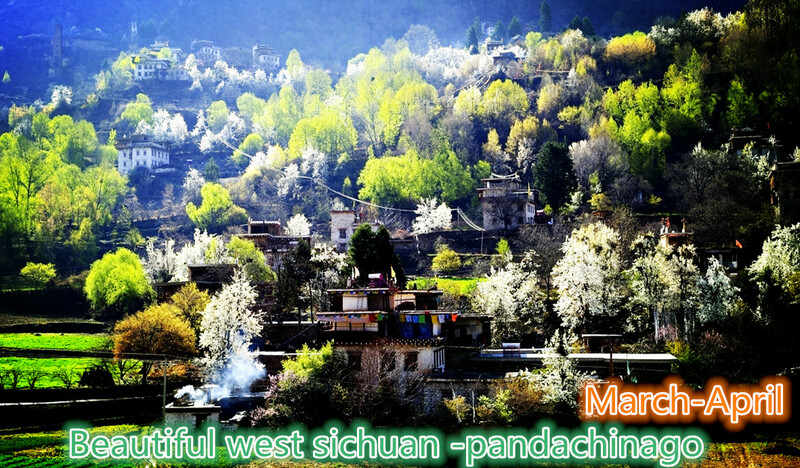 (instead you can choose to JinLi or KuaiZhai Alley, wenshu monastery …as well,based on your interest. )Then drive back to your hotel, end up our service. Kuanzhai Alley is the name of a pedestrian area that has been created by renovating Qing Dynasty hutongs (courtyard houses most famous in Beijing) and making them into shops, cafes, bars and hotels. The area was originally a place where northern Chinese lived so they created a neighborhood in the style of their architecture – this type of hutong house can be found in Beijing but is not original to Chengdu.There are three alleys, Kuan (宽)，Zhai （窄）, and Jing (井) Alleys or 巷子.The alleys are narrow and packed full of shops. The idea is to walk north along Kuan Alley, south along Zhai Alley and then North and out of Jing Alley. 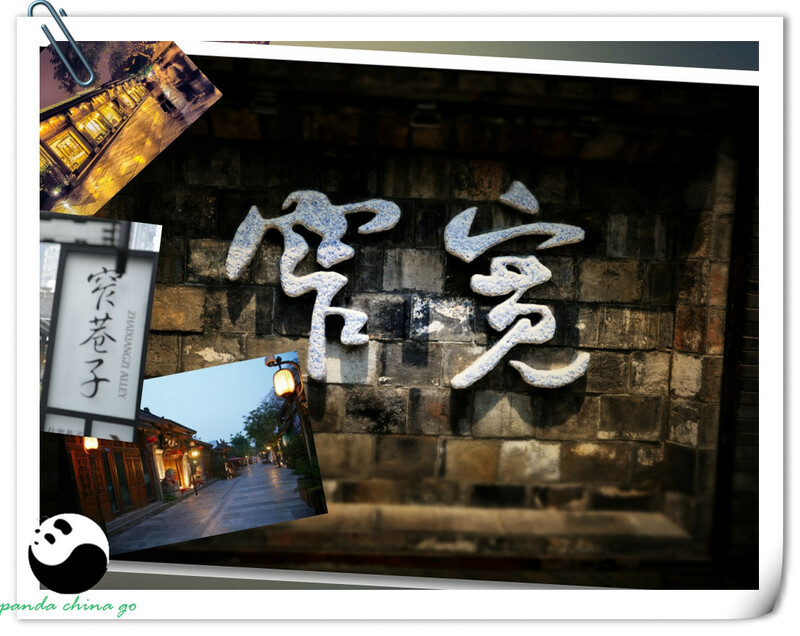 The Kuanzhai Alley is often praised as the name card of Chengdu, capital of southwest China’s Sichuan province. Composed of three ancient streets of Qing Dynasty (1636-1912), Kuanzhai Alley showcases the original local lifestyle. 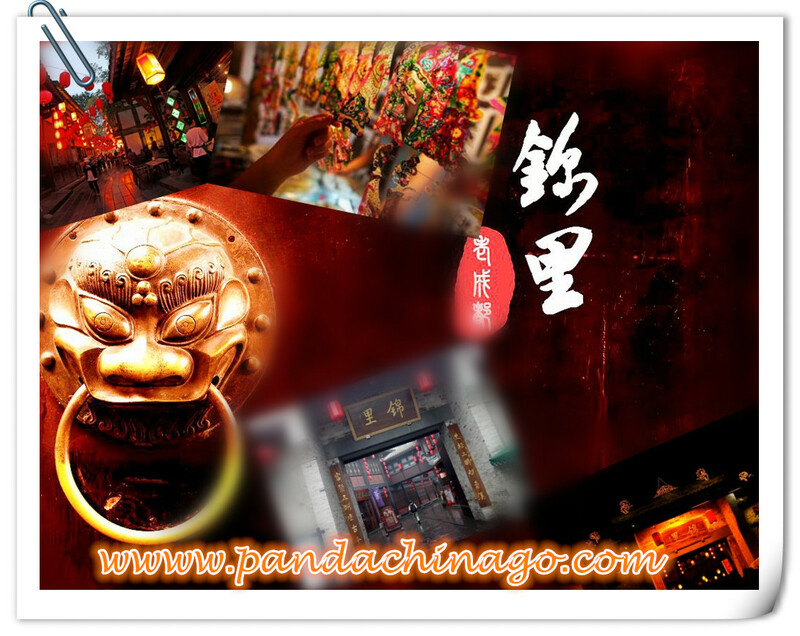 It has been one of the most popular tourist sites in Chengdu. ChengDu Kuanzhai Alley:Kuan (in Chinese literally means Widith or Broad ) Lane mean narrow.all reveal typical Chengdu folk culture. At such a lane, you may find local life style,residents, art shop,taverns, elaborate door headers, plane trees, old teahouses under house eaves, and the likes-being words or expressions unique to Kuan Lane in Chengdu. Kuan Lane is also reflecting on how a city impresses modern people. The old,are drinking tea or chit-chatting at a teahouse gate (apt to drink outside in fine days). What is commonly seen may also be a lazy sleeping cat in a crouching manner, shadows beneath plane trees, and a caged thrush couple among the tree in some courtyard corner and so on. The renovated neighborhood consists of three parallel alleys that are fun to stroll through for some shopping and snacking.Kuan (literally means Wide or Broad in Chinese) Lane represents a most typical Chengdu folk culture. The old, for example, are drinking tea or chit-chatting at a tea house gate (apt to drink outside in fine days). Jinli (Chinese: 锦里古街; pinyin: jǐnlǐ gǔjiē) is a street in Chengdu, Sichuan, China. The street is about 550 meters long. It is a part of the Temple of Marquis, and the buildings are in the Qing Dynasty style. The theme is Three Kingdoms Culture, a traditional folk custom. There are many bars, inns, snack stores and souvenir shops. The street was renovated in 2004. In 2005, Jinli was named as “National Top Ten City Commercial Pedestrian Street”. In 2006, Jinli was named as “National Demonstration Base Of The Cultural Industry” by the Ministry of Culture. There are approximately 18,000,000 visitors a year. Especially in Spring Festival, more people come to visit “Big Temple Fair”. Chengdu People Park (人民公园) This park is a important entertainment place for Chengdu citizen. Everyday, especially the holiday, there are many local people in it, that means tourist can find the real leisure life of local people. There are several tea houses on the grounds, including one of the more famous in the city, the century-old Hemin Tea house (鹤鸣茶馆), and bonsai, orchid garden. There is also a large monument here commemorate the soldiers for the Railway Protection Movement Monument . At the center of the city lies Tianfu Square, the location of the iconic Mao Zedong statue which overlooks Chengdu. Every evening at dusk, as well as at noontime,an elaborate water show, synchronized to music, bursts out from the square’s fountains. Below the square is the hub of Chengdu’s subway system. 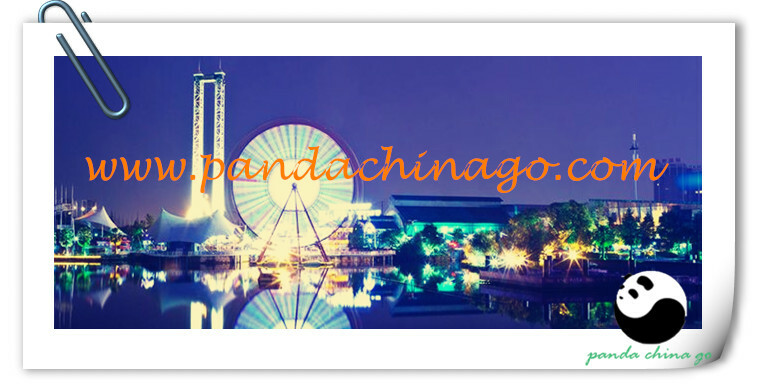 Around the Chengdu TianFu Square have Art Museum,Chengdu Museum, Science Museum,library, shopping mall…. From Chengdu TianFu Square to peopl’s park, only about 10 mins walking distance. From Chengdu TianFu Square to chunxi road,walking distance is about 15 mins. chengdu Wuhou Temple: China has a recorded history of some 3,600 years, beginning with the Shang Dynasty(16th——12th century BC).The first stage is the primitive society. The history was much associated with the supposed pre-Xia Dynasty(21th-16th century BC). The second major period lasted from about 2,000 to 200 BC. The history dated the beginning of the slave society from the Xia Dynasty, which constituted the first Chinese state. The third stage extended all the way from 221BC, when Qin Shihuang united China, to the Opium War of 1840. Historical documents name the third period as the Feudal Imperial Rule. The feudal society in China passed through a period of disunity beginning at the Three Kingdom Period, and ending in short-lived Sui Dynasty(581——618), Western Jin(265——316)via Eastern Jin(317——439) and the Southern and Northern Dynasties(386——589). During this period the warlords took the opportunity to build up their own political and military strength and made themselves into autonomous regional warlords. Finally, the warlords carved the Han Empire into three kingdoms of Wei, Shu and Wu. The populous episodic novel, The Romance of the Three Kingdoms traces the rise and fall of the three kingdoms and vividly depicts the turbulent social conditions at that time. The rulers of the three independent kingdoms struggled for supremacy. Cao Cao and his son established the kingdom of Wei at Loyang. He was in actual control of only the North China homeland. Two rivals soon proclaimed emperors themselves elsewhere. The kingdom of Wu with its capital in Nanjing occupied Changjiang Valley, The kingdom of Shu was created with its capital in Chengdu in the control of Sichuan and parts of the highland of south China. Sino-Ocean Taikoo Li is the living urban heart of future Chengdu. Set in the context of the Buddhist Daci Temple, the low-rise, project provides a unique mix of shopping, dining, drinking, entertainment, live performance, workplace, and hotel accommodation in an exciting and enjoyable setting of lanes, squares, streets, alleys and courtyards. Interwoven into this master plan for urban regeneration is the strategic conservation and adaptive reuse of six preserved buildings and ancient lanes associated with ancient Daci Temple at the heart of the development. The project has evolved out of a unique retail planning concept of “Fast Lane” and “Slow Lane” (play fast, live slow), delivering a diverse shopping and spatial experience to visitors. The “Fast Lane” incorporates luxury brands and high-end contemporary fashion while the “Slow Lane” comprises a line-up of outdoor diners, al fresco cafes and lifestyle stores. The architectural style adopted is both timeless and contemporary, embracing the local spirit and reflecting the details and language of the traditional Sichuan style without resorting to pastiche. It is inspired by the architectural tradition of great shopping streets – the charismatic retail buildings, colorful signage, and attractive shopfronts serve to create a vibrant atmosphere. The layout of the streets and lanes further reinforces the historical context of the project. The ground level buildings create a level of transparency that allows shops and restaurants to express their individual brand and identity. The main structure of the buildings is steel with high quality cladding and glass curtain wall systems. The beauty of Dacisi architecture is manifested in well-proportioned low-rise buildings and sensitive landscape design, creating great public open spaces. The project is positioned as an Urban Retail and Entertainment Destination. The developer aims to recreate a whole-day city-centre shopping and entertainment experience in the town centre by providing everything a modern Chinese consumer could possibly need or want in one complex while maintaining the intimate feel of a boutique-lined side street. The project’s design team focused on creating an environment that would attract and retain consumers, and the leasing team set ambitious targets for brands that are not yet in Chengdu. 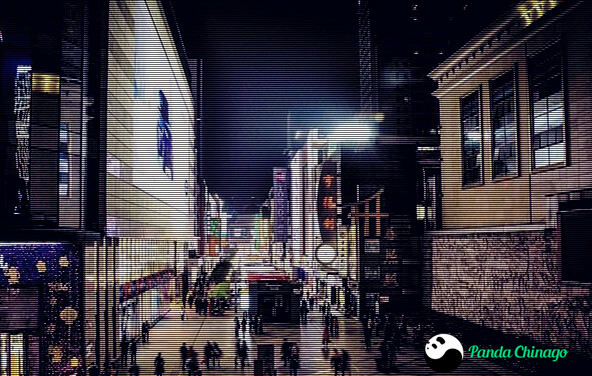 Chunxi Road is the glitziest shopping district in Chengdu and, hosting a million people on summer weekends, definitely the most crowded. The stores here mainly sell brand name foreign goods or their Chinese counterpart. The “street” has been redeveloped around a collection of plazas that stretch out across three or four city blocks, with small sitting parks, high and low-class shopping districts, restaurants and bars, a well-stocked Ito Yakado, and hundreds of other shops. Across from Chunxi Road, to the south, is Yanshikou, the actual hub of shopping for locals (mostly young girls) looking for bargain deals on clothing and accessories. To the north of Chunxi Road is the Holiday Inn Crown Plaza and Taisheng Lu, where everything related to cell phones can be had for a good price. To the east is Tianfu Plaza and the famous Mao Statue. Shopping here can be fun, but the best part of Chunxi Road is getting a bite to eat or some ice cream and people watching. Thousands of people crowd the lanes in between the small plazas around Chunxi Road and many are here to see and be seen as well. Champagne Plaza to the east of Chunxi Road is where a lot of hip hop and skater gear is sold and in the bottom floor of this plaza there is an arcade with basketball hoops and a drum set. The large Buddhist Wen Shu Monastery in the north of town has become a major tourist attraction in Chengdu. The monastery was built during the Sui Dynasty (605BC – 617BC) and fell in the flames of war during the Ming Dynasty.The present temple grounds were built under the supervision of Zen Master CiDu HaiYue in 1697. It is dedicated to the Buddhist representation of Wisdom, Wenshu Pusa (Manjusri Bodhisatva), and contains more than 450 Buddha statues and other precious relics, stone tablet. The temple also has a delightful vegetarian restaurant with seats offering views over the gardens.A tourist/culture district is springing up all around the temple, so finding food, souvenirs is easy. Qing Yang Temple is one of the famous and largest Daoist Temples in China and one of the first 21 Daoist Temples allowed to reopen by the government in 1983. Why is the temple called Green Ram(Qing Yang) Temple? Well it all went back to a meeting between a Taoist high priest called Lao-tzu who was to meet a friend here. The friend arrived only to see a boy with two goats and so thought the boy was his friend the priest! The showpiece of the Green Ram Temple is the 20 meter high Eight Traigrams Pavilion. It was rebuilt in 1873 during the reign of Emperor Tongzhi and in 1883 during the reign of Emperor Guangxu. It is a three-storey octagonal pavilion with a round roof and square base on which the eight trigrams – Qian, Dui, Zhen, Li, Xun, Kan, Gen and Kun are engraved. 16 stone pillars arranged in double rows support the eaves. Inside and outside the pavilion are some 81 dragons. Enshrined inside is a statue of Laozi, the supreme venerable sovereign, riding a green ox heading west towards the Hangu Pass. chengdu qintai road Located just West of Central Chengdu, Qintai Lu is an ancient-China themed street which is a popular tourist destination. Hotpot restaurants, tea houses, and Sichuan opera venues line this street, which is illuminated by lanterns and ambient lights in the evening. A beautiful street to stroll down in the evening, this area stays open until late at night when the last hotpot patrons have retired to their homes or hotels. 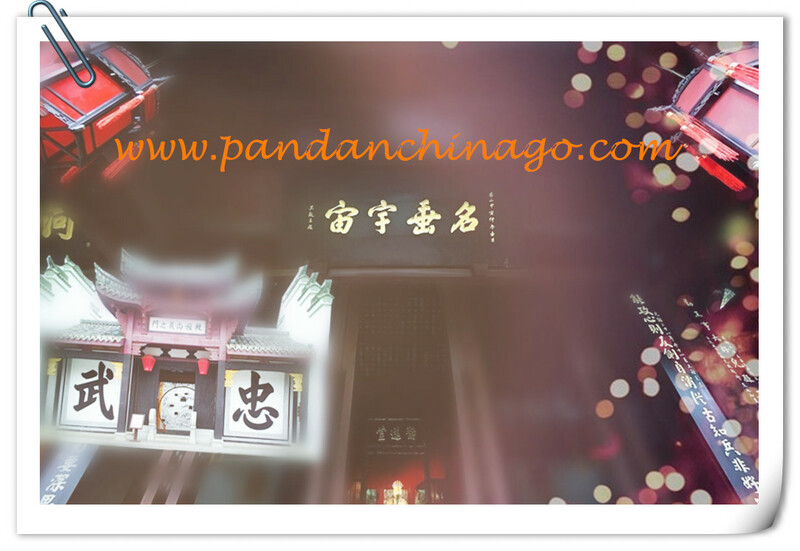 The most well known Sichuan Opera house in Chengdu, Shufeng Yayun, is located on Qintai Lu. Dufu Thatched Cottage was once home to the famous Chinese poet Dufu. Crowds have visited the place to catch a glimpse of this historical life and view the beautiful buildings that make the site a wonderful place to visit. The main building of Dufu Thatched Cottage is the Hall of Verse History, which houses a majestic statue of Dufu. Outside the Hall, visitors can see the Flower Bathing Brook lazily meandering through the building of chengdu Dufu Thatched Cottage. In 759 Du Fu moved to Chengdu, built a thatched hut near the Flower Rinsing Creek and lived there for four years. The “thatched hut” period was the peak of Du Fu’s creativity, during which he wrote two hundred and forty poems, among them “My Thatched Hut was torn apart by Autumn Wind” and “The Prime Minister of Shu”. The original thatched hut built by Du Fu was destroyed. Key buildings in the Du Fu Thatched Cottage were constructed in the early 16th century during the Ming dynasty and extensively renovated in 1811 during the Qing dynasty. Du Gong Bu memorial Hall (Du Gongbu ci), where the life and work of Du Fu was displayed, the library area displayed published works of Du Fu, including some rare Song dynasty wood carving editions. The foreign language section displays a large number of foreign language books of Du Fu’s works. The Thatched Cottage of Du Fu. A reconstructed thatched hut partitioned into a study, a bedroom and kitchen, recreating the living and working environment of Du Fu’s time. The Hall of great poets (Da Ya Tang). An exhibition hall with a 16 meter long by 4 meter tall mural painting portraying scenes from Du Fu’s poems: “My Thatched Hut Wrecked by the Autumn Wind” and “A Song of War Chariots”. There are also statues of twelve prominent Chinese poets (including Qu Yuan, Tao Qian, Li Bai, Wang Wei, Su Shi, Li Qingzhao, Lu You) on display. The Jinsha Site was found in February 2001 in urban Chengdu. It covers 5 square-kilometers, and dates back to 12th to 7th century B.C. (approximately 2900 – 3200 years ago). It was the capital of the ancient Shu Kingdom, which is considered to be the ancient civilization center along Yangtze River. It is the first major archaeological discovery in China at the beginning of the 21st century, and also a significant archaeological event following the discovery of the Sanxingdui site in Sichuan Province. Therefore, it has become one of the Ten Major Archaeological Discoveries of China in 2001. So far, archaeologists have unearthed important features of large-scale palace foundation, sacrificial area, residential area, and burial site. On the site, a great variety of artifacts in large numbers were unearthed, including more than 5,000 articles of gold, bronze, jade, stone, ivory, and lacquered wood, as well as millions of pottery potsherds, tons of ivory and thousands of boar tusks and deer horns. Therefore, it is considered that the Jinsha Site has unearthed the richest gold and jade wares and the densest elephant tusks in the world. At present, it can be confirmed that after the decline of Sanxingdui civilization, Jinsha Site should be another arisen center of politics, economy and culture in Chengdu Plain mainly from late Shang Dynasty to Western Zhou Dynasty, and also one of the most important archaeological sites of Pre-Qin period in China. The discovery of Jinsha Site is of great significance for the study of Shu culture, including its origin, development, and decline, and provides convincing evidence for an explanation of the abrupt disappearance of Sanxingdui culture. Jinsha Site revives the lost glory in history, and unveils the prosperity of ancient Shu kingdom.The site, together with the ruins of prehistorical cities in Chengdu Plain, the Sanxingdui site and the canoe-shape coffin graves of the Warring States period, represent the four different stages of ancient Shu culture. The discoveries not only have proved that the Chengdu Plain was the center of ancient civilization in the upper reaches of the Yangtze, and an important component of Chinese civilization, but also provide crucial evidence to the theory that the origins of ancient Chinese civilization is a unity of pluralism. Opening Hours: 8:00a.m. - 5:00p.m. The Wangjiang Park encompasses an area of 120,000 square meters.Wangjiang means overlooking a river from a distance. The park is renowned because the famous poet, Xue Tao (768 - 831), once lived here. Luxuriant bamboos are planted here because they are the poetess' favorite. 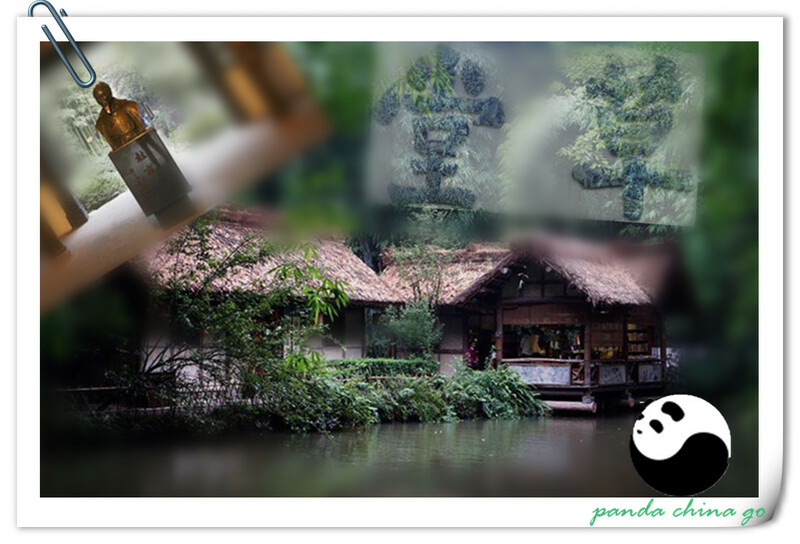 So, it is also the ideal place to appreciate bamboos in Chengdu City. If you are fortunate, you can see the Bamboo Culture Festival here. Built in 1889, the 39-meter-high Wangjiang Tower is the greatest building in the park. When the Wangjiang Tower, was built during the Guangxu Reign of the Qing Dynasty, it was known as Chongli Tower. Of the four stories of the tower, the upper two are octagonal while the lower two are square with every eave layer exquisitely decorated with sculptures. It is exquisite and beautiful with vermilion columns, glazed tiles and gilt cupola. The tower stands by the side of Jinjiang River, hence the name of the Wangjiang Tower (Tower Overlooking the River). The Wangjiang Tower has been regarded as a landmark in Chengdu City. Overall Good day out for both adults and families, makes a nice break from the city and has enough attractions to fill a full day out. ChengDu New Century Global Center is a multipurpose building in the Tianfu New Area of Chengdu, China, and is the world’s largest building in terms of floor area. Developed by billionaire Deng Hong’s Entertainment and Travel Group (ETG), nearly 400,000 square metres (4,300,000 sq ft) of the building is devoted to shopping. It also houses offices, conference rooms, a university complex, two commercial centres, hotels, an IMAX cinema, a “Mediterranean village”, a pirate ship and skating rink. The centrepiece of the building is a water park (“Paradise Island Water Park”), containing a 5,000 m2 (54,000 sq ft) artificial beach, where a giant 150 by 40 m (490 by 130 ft) screen forms the horizon to offer sunrises and sunsets. At night, a stage extends out over the pool for concerts. A stand has been built overlooking the pool with a food court and entrance underneath at the floor level. The new Intercontinental Hotel will feature 1,009 rooms that are spread over 6×8 story blocks around the edge of the complex. The centre is connected to Line 1 of the Chengdu Metro. Although parts of the shopping area opened in early 2013, the centre was supposed to have formally opened in March 2013 when it hosted the Global Fortune 500 conference. However, the businessman behind the project, Deng Hong, was arrested on corruption charges, and “given the potential for political humiliation” the conference was moved to the Shangri-La Hotel in Chengdu. The opening was delayed until 22 August 2013, but was calmed down and scaled back after the arrest of more than 50 local government officials being detained in a series of overlapping investigations.